Commander Eric Tufnell RN (1888-1979). 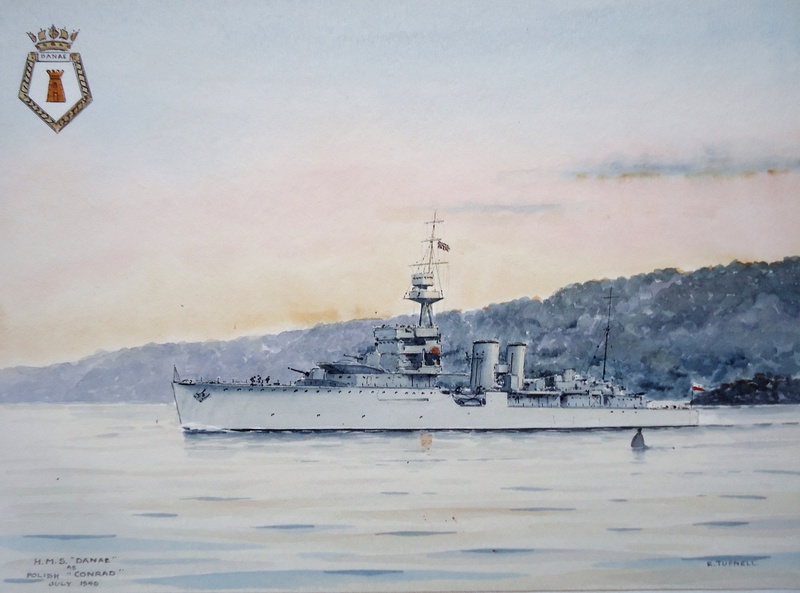 Watercolour, signed (LR) and inscribed "HMS DANAE as Polish CONRAD July 1946" (LL). In Sepember 1944 the light cruiser HMS DANAE was loaned to the Polish Navy: the Poles had been fighting fearlessly and vigourously with the Allies for over 4 years and this loan was a logical step in harnessing the competence and fierce enthusiasm of the Poles. Taking her new name, we read, from the widely read author of that country, Josef Conrad, ORP CONRAD served initially with the Royal Navy's 10th Cruiser Squadron before shifting to the 29th Destroyer Flotilla. CONRAD was returned to the RN in September 1946, this watercolour being dated by Eric Tufnell July 1946 when CONRAD was commanded by Kmdr Romuald Tyminski. Reverting now to her name DANAE, the 30 year old cruiser's days were numbered and she first was placed in the Reserve Fleet before being de-equipped and then towed away in early 1948 for scrapping.